I'm upgrading from a Draytek Vigor 2800 Router to a netgear FVS336GV1 Firewall. On the Draytek, the Port Forwarding setup allows me to set different public and private ports - for example, I have incoming WAN traffic on Port 2500, but I redirect that to Port 25 on a private IP. I also have several devices on different private IP addresses, which I want to access on the private port 80 - with the Draytek, I have incoming connections on different port numbers (eg 8070, 8080, 8090, etc.) which redirect to port 80 on different private IP addresses. 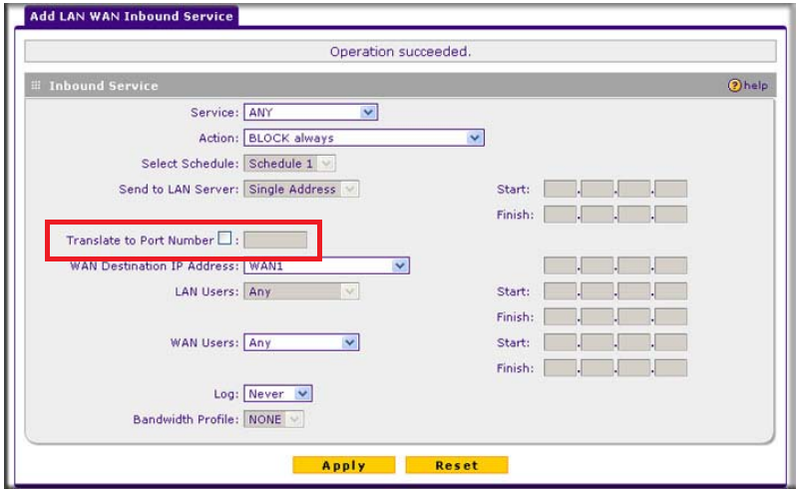 I can't see a way to replicate this configuration on the Netgear - Port Redirection only allows me to specify an incoming port and a private IP. Please see page 66 of the User manual for the description. May thanks JohnRo - I knew it had to be in there somewhere! You are welcome! I am glad to help.